Announcement Lucy's Lazy Dayz Primitives, Lucy's Lazy Dayz Folk Art, Primitive, folk art, mailed patterns, instant download patterns and finished dolls are what you will find here. Everything you see here is designed as well as handmade by me. I love to experiment and play with fabric, needle, thread and paint. EVERYTHING I DO IS AN ARTISTIC RENDERING FOR DISPLAY ONLY...THESE ARE NOT DESIGNED OR MEANT TO BE CHILDREN'S TOYS UNLESS SPECIFICALLY DESCRIBED AS A TOY. I have my mother, father and grandmothers to thank for my love for sewing, crafting and use of textiles. I recycle, upcycle, and repurpose items whenever possible. I hope you enjoy the items I create as much as I enjoy creating them. This is where I play and experiment with new ideas. my blog: http://www.lucyslazydayzprimitives.blogspot.com/ is sadly neglected but has some interesting posts. Lucy's Lazy Dayz Primitives, Lucy's Lazy Dayz Folk Art, Primitive, folk art, mailed patterns, instant download patterns and finished dolls are what you will find here. It was important to my family that I be a stay-at-home mom. We lived miles from the nearest employment opportunities and since I've always loved playing with fabric and my sewing machine a friend suggested I make things to sell. I'd made dolls for my children and nieces and nephews so that was the direction I took. I started my dollmaking business in 1980 with the leftover fabrics I had on hand and patterns I found in books at the library. For the first few years, I used the profits from each sale to purchase more materials and supplies and eventually I even purchased patterns. I was not satisfied with the patterns that were available (I wanted something a little different than what was available but I still purchase patterns to learn new techniques) so I began designing my own. Thanks to my mother, I started sewing before I started kindergarten. I got my first sewing machine when I was 7 and haven't been without one since then. 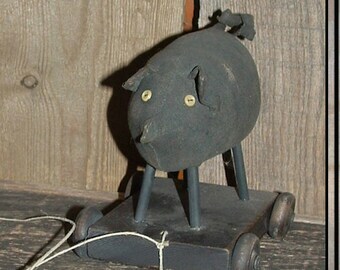 I love to design and make primitive and folk art dolls and critters. With crafty, thrifty grandmothers and mother, I've always sewn and crafted. Making my own clothing and doll clothes was just the beginning of a love of sewing and designing dolls, critters, and home decor. MY DESIGNS ARE ARTISTIC CREATIONS AND NEVER MEANT TO BE TOYS FOR CHILDREN. All of my creations are made of fabric. Most are stained, some are painted, see the description of each for details. I use recycled fabrics whenever I can and it'll be in the description when I do.